Founded in Milan in 1937, MAPEI is one of the world leaders in the manufacturing of adhesives, sealing and chemical products for the building industry today. Currently, 70 subsidiary companies with 64 factories belong to the MAPEI group, which is active in more than 31 countries on all five continents. In November 2013, MAPEI awarded a contract for the construction of a new dry building material mixing plant to the Austrian general contractor BT-Wolfgang Binder GmbH. The order is worth €2m. BT-Wolfgang Binder carried out the entire planning, construction, production and delivery of the machines, the silos and the steel structure, including the façade. The silos, the steel structure and the tanks and containers were built in Malaysia according to the statics and shop drawings provided by the general contractor. The machines were packed for carriage overseas and dispatched in containers to Malaysia from Koper (Slovenia). Chief erectors and a supervisor deployed by BT-Wolfgang Binder performed the assembly, assisted by Malaysian personnel. The concrete foundations and the electrical installations were provided by the customer. In mid-October 2014, the plant was successfully handed over and production in Nilai in central Malaysia could begin. 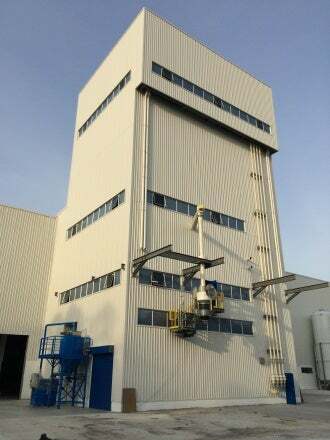 Thanks to excellent collaboration between BT-Wolfgang Binder’s project department, the customer in Malaysia and the engineering department of MAPEI in Milan, supervised by Dr Guido Trussardi and project manager Stefano Barsotti, the plant could be handed over and commissioned according to schedule, despite the great distances. During hand-over MAPEI ordered another dry building material mixing plant for Australia at BT-Wolfgang Binder. Dosing screws in hopper scales perform the dosing process whereas the dosing of additives is taken care of by small component scales. The plant includes six additive containers with a capacity of 2m³ each and a fibre box. From the scales, the material is fed into the batch mixer, which has a net capacity of 2,400l. Image: New dry building material mixing plant. Photo: courtesy of BT-Wolfgang Binder.